Finding time for quiet contemplation. When I sat down to write a priority list for my last year to live project, I quickly scribbled “make time for silent reflection” right near the top. Call it the No-Atheists-in-Foxholes Theory. Or blame it on my being a Pisces. But whatever the reason, I feel so strongly about the power of contemplative practices that I’ve rearranged heaven and earth to clear my work schedule and recruit friends/family/babysitters to watch the kids while I head out of town for a 10-day silent meditation retreat. 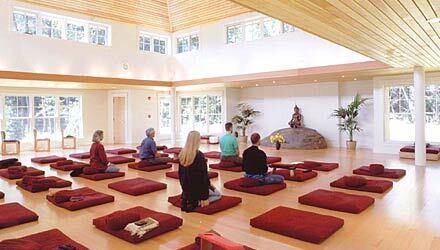 As of Friday afternoon, I’ll be meditating in the hall pictured here. The truth is that I first came to meditation several years back, feeling weary to the core. While seemingly everyone around me was starting a family of their own, difficulties with pregnancy and heartbreaking miscarriages had left me feeling battered and limp, like all the joy had been sucked out of living. Nothing in my life had prepared me for feeling that low. Then one day I saw a flyer for a program at the Cathedral of St. John the Divine called “Universal Meditation Masters: A Conference on Meditation from Five Faith Perspectives.” It must have been the word “universal” that caught my eye. For as long as I can remember, I had rebelled against the idea of there being one chosen faith. (“How could millions of people tell billions of others that what they believe is wrong?” I remember indignantly – and quite tactlessly – questioning my poor mother from the back seat of our Buick wagon as we drove home from church one morning.) If there was something that all major faith traditions could agree on, I needed to hear about it. The 3-day program blew my mind. Here was the Benedictine monk Father Laurence Freeman; the head of the Sufi Order of Islam in the west Pir Vilayat; the Buddhist nun Sister Annabel Laity; Reconstructionist Rabbi Marcia Prager; and the founder of Integral Yoga, Sri Swami Satchidananda. I recently found my aging notebook from that restorative weekend. They had spoken about kindness, forgiveness, equality, calm, simplicity, presence, compassion. About how our very wounds can be the gateway to new beginnings if we choose to see them as such. Most of all, they had all agreed that time spent in quiet reflection can be utterly transformative. Fortunately for me, New York City is a very easy place to learn to meditate. In the midst of all the hustle, there are meditation centers of all stripes. I pretty much tried them all, finally alighting on the non-sectarian vipassana meditation as the one most in sync with my disposition. All these years later, what do I get out of meditation? I think one of the most important things I take from it is a keen awareness that there are no hierarchies of moments. Being outside with the kids on a beautiful beach day when we’re all happy is totally equal to the moment when I’m rushing frantically through the driving rain on my way to the subway so I can get to a meeting on time. Hard to explain. But if I can remember that, life seems so much more vibrant a lot of the time. I also feel that meditation helps me remember that there’s a vast, calm reservoir right below the surface that I can get in touch with at any point, as long as I remember to check in. Mainly, meditation reminds me that everything is workable. Every stressful situation, every difficult person. That’s not to say that I now have it “all figured out” — far, far from it! But meditation feels like the key to something. I have no idea yet what it unlocks, but I found a tool that works for me, and I’m continuously humbled by it. Before I go silent on you for 10 days, I thought I’d share this wonderful poem by Wes Nisker. Be well, everyone!! I meditate because I suffer. I suffer, therefore I am. I am, therefore I meditate. I meditate because there are so many other things to do. I meditate because when I was younger it was all the rage. I meditate because Siddhartha Gautama, Bodhidharma, Marco Polo, the British Raj, Carl Jung, Alan Watts, Jack Kerouac, Alfred E Neuman, et al. I meditate because I have all the information I need. I meditate because the largest colonies of living beings, the coral reefs, are dying. I meditate because I want to touch into deep time, where the history of humanity can be seen as just an evolutionary adjustment period. I meditate because evolution gave me a big brain, but it didn’t come with an instruction manual. I meditate because I want to experience the world as Rumi did, or Walt Whitman, or as Mary Oliver does. I meditate because now I know that enlightenment doesn’t exist, so I can relax. I meditate because of the Dalai Lama’s laugh. I meditate because there are too many advertisements in my head, and I’m erasing all but the very best of them. I meditate because the physicists say there may be eleven dimensions to reality, and I want to get a peek into a few more of them. I meditate because I’ve discovered that my mind is a great toy and I like to play with it. I meditate because I want to remember that I’m perfectly human. Sometimes I meditate because my heart is breaking. Sometimes I meditate so that my heart will break. I meditate because I’m growing old and want to become more comfortable with emptiness. I meditate because Robert Thurman called it an “evolutionary sport,” and I want to be on the home team. I meditate because I’m composed of 100 trillion cells, and from time to time, I need to reassure them that we’re all in this together. I meditate because it’s such a relief to spend time ignoring myself. I meditate because my country spends more money on weapons than on all other nations in the world combined. If I had more courage, I’d probably immolate myself. I meditate because I want to discover the fifth Brahma-vihara, the Divine Abode of Awe, and then I’ll go down in history as a great spiritual adept. I meditate because I’m building myself a bigger and better perspective, and occasionally I need a new window. I’m enjoying your blog so much. Every one is a wonderful reminder. Thank you. Thank you so much for reading! I wanted to anonymously share part of a private message I received too, which is such a great piece about meditation and life. I wonder if I could write in response about why, after thirty five years, I continue to meditate each day as if it is the first time. At this point, it is part of my life and i probably would ask, why would I not meditate. The image most fresh in my mind is of growing roots into the deep ground of non being, boddhicitta, the vast presence of open space compassion non dual non personality driven goodness . fund in us all in all everything… the female wisdom emptiness of mind.. refreshment, nurturance, inspiration. It is succor to meditate and rest the busy mind. If I forget, ignore or simply rebel — thinking that I have enough goodness and simple presence stored up, my wild mind begins to get the upper hand. The trap door into sanity gets a rusty and its oiled open hinges start to shut down – producing impatience and irritation – Old habits that I was sure had disappeared make themselves known like compulsive repeated songs. But at this point, again, and again, sitting down, the habits arise and they are merely thoughts, not misery and I am reminded with penetrating tenderness of the causes of war and conflict, self hatred and the even stronger power when thoughts are fleeting.. of patience, kindness and of tolerance and the knowledge of unconditional open heart. thank you Barbara!